These pretzels taste just like they came from your favorite pretzel store in the mall. can be found in shopping malls and airports everywhere. I bet you will find that these are irresistible. After you brush with butter try sprinkling with coarse salt. Or for Cinnamon Sugar Pretzels, try melting a stick of butter in a shallow bowl (big enough to fit the entire pretzel) and in another shallow bowl make a mixture of cinnamon and sugar. Dip the pretzel into the butter, coating both sides generously. Then dip again into the cinnamon mixture. Enjoy! Love Pretzels? Check out these Pretzel inspired recipes! You can make Pretzels that taste just like Auntie Anne's. Sprinkle yeast on lukewarm water in mixing bowl; stir to dissolve. Add sugar, salt and stir to dissolve; add flour and knead dough until smooth and elastic. Let rise at least 1/2 hour.While dough is rising, prepare a baking soda water bath with 2 cups warm water and 2 tablespoons baking soda. Be certain to stir often. After dough has risen, pinch off bits of dough and roll into a long rope (about 1/2 inch or less thick) and shape. Dip pretzel in soda solution and place on greased baking sheet. Allow pretzels to rise again. Bake in oven at 450 for about 10 minutes or until golden. Brush with melted butter and enjoy! Toppings: After you brush with butter try sprinkling with coarse salt. Or for Cinnamon Sugar Pretzels, try melting a stick of butter in a shallow bowl (big enough to fit the entire pretzel) and in another shallow bowl make a mixture of cinnamon and sugar. Dip the pretzel into the butter, coating both sides generously. Then dip again into the cinnamon mixture. Enjoy! WOW! I am German and I just been to the USA and had Aunt Annie’s for the first time. 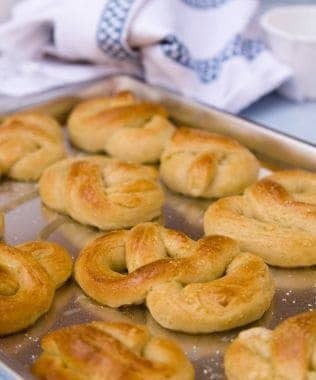 Found this awesome recipe, I have to say, the result tastes just like the pretzels from Aunt Annie’s. I coated them in a cinnamon sugar mixture… YUMMY!!! It works just fine with the sticky dough, but you can add some flour too, no problem. am I supposed to boil the pretzels in the baking soda water bath or just dip them in the warm water with baking soda? I would boil them in there for about 30 seconds. My dough was like super sticky and my ropes kept breaking when i tried to make them less than an inch thick, so i’m not quite sure where i went wrong. Has anyone else had this problem? Then you needed to add more flour. Bread making is more of an art than an exact science. Something as simple as humidity can impact this recipe. If your dough is super sticky start by adding 1/4 cup of flour knead through, and if it remains sticky add more flour. Some bread recipes will have you add another 1 cup to the recipe. Im a little confused…2.5tsp are in a packet of yeast. So how much do I put in? 1 1/8 tsp or 1.5 packets? very good recipe. i would also suggest that you ensure they are made thin. it helps give it the mall style pretzel texture. i did not have bread flour so i just use 4 cups of all purpose. still came out very very delicious. just as good as mall pretzels. These were really good! Just like the pretzels at the mall! I made mine a little big so next time I will make my rope smaller in size. I did an inch instead if 1/2 inch like it said.